Small containers, such as Euro boxes and KLTs, are the common industry standard for the transportation and storage of small to large parts. They are ideal in situations where space is limited due to various sizes being able to be stacked on one pallet. 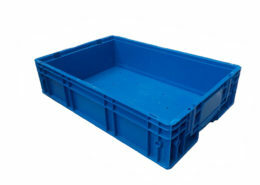 These containers work on a standard footprint and are either folding or rigid. We can supply a variety of sizes to best fit your needs. Along with this we can offer you a CAD concept to enable you to choose the right option for your part, as well as your working practices. Various ways of fitting can be utilised. 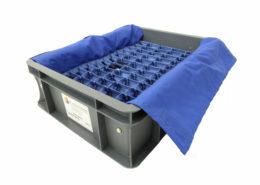 Velcro is a cost effective method of attaching dunnage to a Euro / KLT but can only be used when the parts are very light- this fastening method does have a limited life. 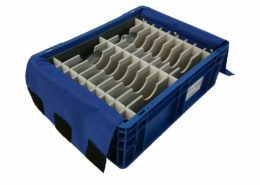 Using a corrugated plastic structure allows the dunnage to fold down enabling it to be used with a folding Euro / KLT- this also allows the full width of the box to be utilized. For a more durable solution the dunnage can be supported on fibreglass rods- these create tension between the dividers enabling multiple layers to be used. The benefit of this is that up to 4 layers can be used. Please click on the below portfolio images to see examples of our small container packaging solutions.